I reckon the movie character Forrest Gump (as played by the actor Tom Hanks) gave running a bad rap. Whatever! I took up running as a sport well before that 1994 movie anyway, and this was a lucky turn of events for me because I was unceremoniously transferred to a school which demanded not only regular homework, but also compulsory sports from all of its students. Running was one of those compulsory sports. In Australia, school years for children range from: Preparatory; then Primary School (years one through six); and then Secondary or High School (years seven through twelve). For my first few blissful years of secondary school in years seven and eight, I attended what I feel must have been the most hippy dippy school in the entire state. During those two years, I learned a great many things, some of which even applied to the curriculum that other children in the state were learning. As one example, I knew who the most frightening character “Jason” was, in the horror film Friday the Thirteenth. On the other hand my grasps of the complexities of geometry and trigonometry was perhaps a bit sketchy. As an interesting side note, that hippy dippy school has long since been converted into a swanky housing estate. So it was that I found myself one fateful day towards the end of my time at that hippy dippy school, understanding the truism as declared by that genius of military strategy, Sun Tzu: never to underestimate your opponents. You see, I was attending a parent / teacher night with my mother, who conferred with the enemy (a teacher), who remarked to my mother that: Chris was a good student who was also a bit unruly but would benefit from a more disciplined and rigid school environment. I knew defeat when my mother gave me a searching look as I could almost see the unspoken plans formulating in her mind. The following year (year nine), my mother transferred me to a more disciplined and rigid school environment. The new school had formal suits and ties, school rules, no girls, cadets, lots of homework, formal exams, after school and weekend sports, and only one new kid that year. I have always felt that the school was more English than even the English are. It even had a historic oak tree surrounded by paving that looked suspiciously to me like a Union Jack design! My carefree days had clearly finished with a resounding thud. Nowadays, people ask me what do I believe is meant by the term “community”? Well, I reckon the word “community” means learning to live with the people that you find around you. And way back in those days at that more disciplined and rigid school environment, this simply meant that I had to learn how to live with all of people that I suddenly found around me. Niccolò Machiavelli, who it is fair to say knew something about politics and human social interactions, would have been outclassed by the sheer intrigue and social dynamics that I found myself unceremoniously dumped into. By the time that I turned up in year nine, the majority of social cliques were already established. I lacked the social skills of Niccolò Machiavelli and the wisdom of Sun Tzu and was unable to break into the existing social cliques. Well that is with the exception of the dork group, who took me into their social clique. This was a good thing because as Niccolò Machiavelli would have understood it is better to be surrounded by friends and allies than to be a lone target. I slowly understood the social machinations of that more disciplined and rigid school environment and learned how to keep out of trouble. Actually by that, I meant mostly out of trouble, because after school detention seemed remarkably easy to end up in. The fun thing about after school detention was that you were encouraged to write quickly, and this was an important skill to learn. You see, the quicker that you wrote out a copy of the school rules (and there seemed to be an awful lot of rules) the quicker you got out of after school detention. One aspect of the social machinations that troubled me the most were the informal after school fights. The way the informal fights worked were that children of higher social cliques (and as a dork I wasn’t quite at the bottom of the social pecking order, but I could certainly see the bottom very clearly) chose two other children to fight at a specific place and time. Heaven help the feckless child who failed to attend an informal fight because their lives would be made a misery from that point onwards. Having previously lived a blissful carefree hippy dippy existence, I had never been involved in a fight of any sorts, let alone thrown a punch or two in anger. However, once I was aware of this impending doom of the informal after school fight, I immediately enrolled at the local karate dojo (using much of my hard earned paper round money) and trained several nights per week. Fortunately, my turn for an after school fight took quite a while to arrive, and when the bell tolled for me, I destroyed the other kid (although not hurting him too seriously). After that I was never bothered again and enjoyed improved social status. My improved social status at the more disciplined and rigid school environment meant that I was able to relax a bit and enjoy secondary school and maybe I even learned a thing or two. Unfortunately, I still didn’t know anything about geometry and trigonometry, but in other subject areas I managed to slowly claw my way back into the top quartile of results for students. The lesson that I took away from all of that experience is to: Know thy enemy so that you do not underestimate them. Sun Tzu would approve. The overnight temperatures have been colder here than at any other point in the previous six months. Some parts of the continent further west and north of here are enjoying a recording breaking cold spell. 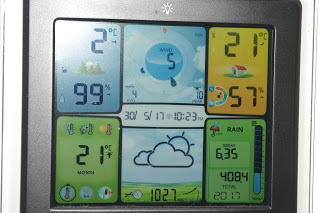 In this more temperate part of the continent, the overnight temperatures have been just simply cold at 2’C (35’F). Observant readers will note that winters here are extremely humid (99% outside and 57% inside) and thus very damp affairs! 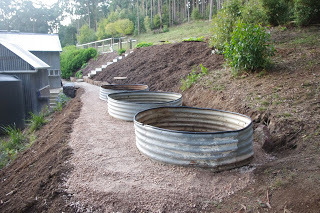 Cold weather is perfect for working on the infrastructure and this week we relocated the three steel round raised garden beds which are used for growing potatoes. 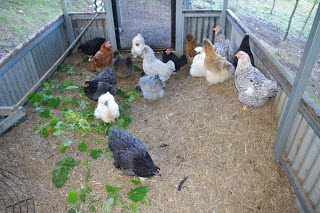 The soil and potatoes themselves were not relocated. The reason for the relocation of the steel garden beds is that there is now a permanent terrace for growing potatoes. Observant readers will note in the above photo that there is an existing blackberry and raspberry enclosure on that terrace. 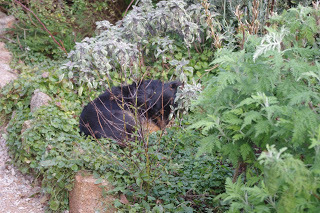 Now that the the three raised potato beds have been relocated, that berry enclosure can be extended. There are plans afoot to do that extension over the next few weeks. 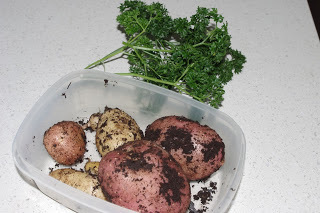 As potatoes are required in the kitchen, we have been simply extracting them from the soil. 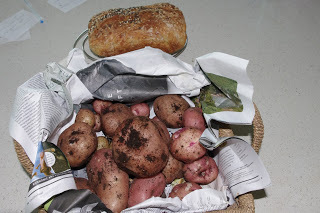 Home grown potatoes have a superb taste! Eventually we expect that all of the soil from the remaining potato mounds (visible in the above photo) will be removed. We also are intending to relocate some of the potato tubers and have plans to increase the diversity by purchasing a new batch of diverse seed potatoes. The relocated steel round raised garden beds are looking very good on the new dedicated potato terrace. 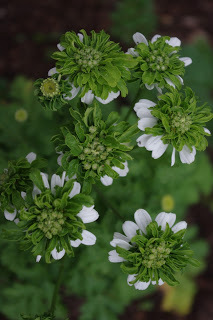 A goodly quantity of crushed rock with lime was placed around the beds providing an all-weather surface to walk upon. 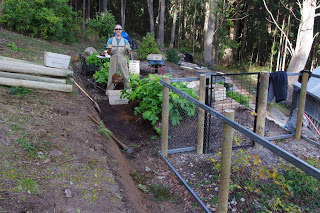 The sloping garden bed above the new potato terrace was covered with a cubic metre (1.3 cubic yards) of composted woody mulch. 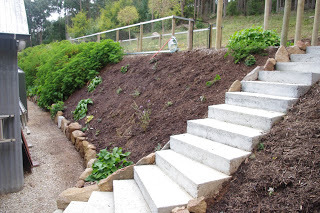 Over the next few months we will begin planting this sloping garden bed with flowering plants for the benefit of the insects, frogs and reptiles who will all eventually live in that garden bed. On warm nights, the existing garden beds produce a symphony of frog calls from the many Southern Brown Tree Frogs who live in the garden beds. 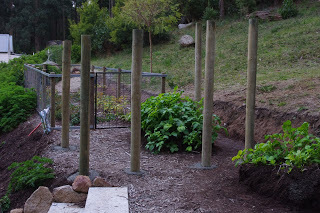 There are also plans afoot to extend the tomato / eggplant / capsicum (pepper) enclosure over the next few weeks. 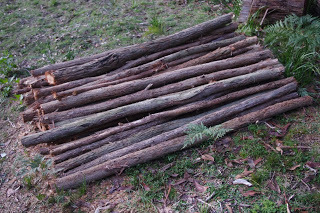 That current enclosure is fenced using locally sourced pickets and so in order to extend the enclosure we have begun the process of producing further pickets. 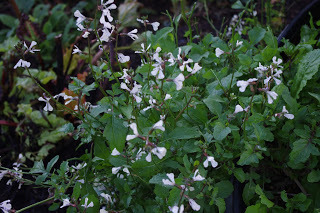 I rarely purchase new plants nowadays as I have learned over many years to propagate most of the plants grown here using either cuttings or seed. 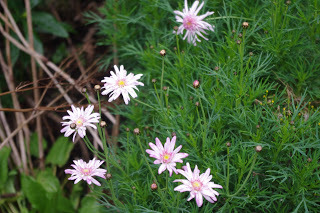 But some of the edible plants are so prolific, they simply self-seed. 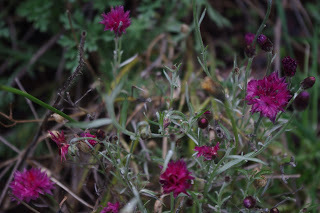 When I find these useful seedlings growing about the place, I relocate them to where I need new plants to grow. 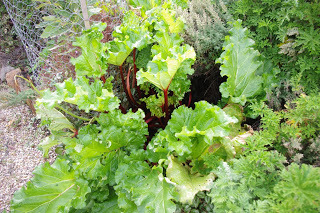 In the next photo I can see four red lettuce plants and a rhubarb seedling. Speaking of rhubarb, it is one of the hardiest of all plants here and provides new stalks for consumption all year around. It is also a very tasty (warning – consume only the stalks as the leaves are toxic) addition on top of toasted muesli for breakfast. 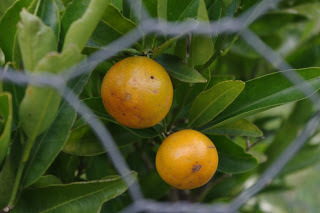 This year we have been harvesting mandarins for the first year, and they are very tasty fruit indeed and far tastier than the very mild tasting store purchased mandarins. 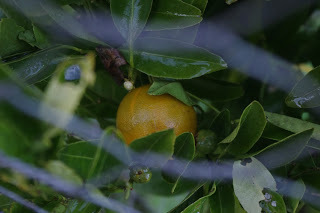 Mandarins are being harvested here this year for the first time. And they’re excellent tasting! Earlier in the week we travelled further afield to the coast to watch the ocean during its winter moods. I love the coastline over the winter when the crowds are few and far between and the winter winds and cold air whips up the ocean swells and reminds us just who is the boss. 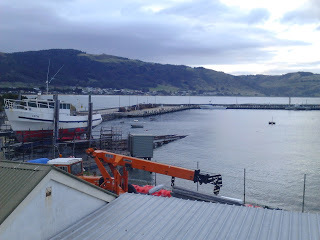 The view from the fish and chip shop looking across the harbour to the mountain range which rises up behind the township is just superb. And the fresh local scallops were even better! 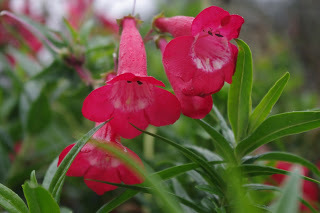 It is hard to believe it, but even as winter tightens its grip on the farm, there are still plenty of flowers showing off around the place this week. The temperature outside now at about 9.15pm is 8’C (46’F). So far this year there has been 385.8mm (15.2 inches) which is more than last week’s total of 373.4mm (14.7 inches). 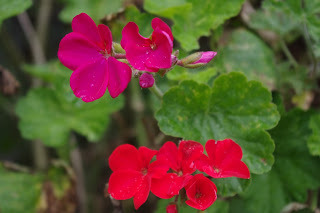 We have to take a short detour from the story of the previous two weeks because it is now less than a week and half to the winter solstice (in the Southern Hemisphere at least). For about a month either side of the winter solstice, my mind reflects upon the deficiencies of the off grid solar power system here. Don’t get me wrong, I love solar energy as it is a great source of electricity. 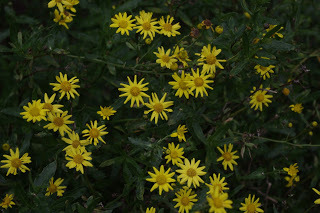 It just happens to be subject to some deficiencies which generally show up at this time of year. 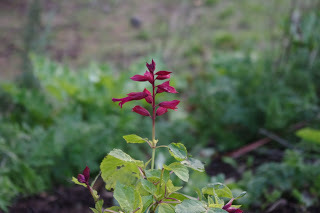 Some of those deficiencies are site specific because the farm is on a south western facing slope of the mountain range. 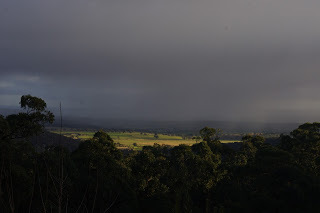 During winter this side of the mountain range enjoys less sun than on the north facing slopes (the reverse is true in the Northern Hemisphere). Perhaps this is why it is less fashionable than the other side! The tall trees surrounding the farm also grow ever taller each year, and the slightest shadow on a solar photovoltaic panel (we’ll just call them solar panels from here on) reduces the electrical output of that solar panel far more than would seem likely. 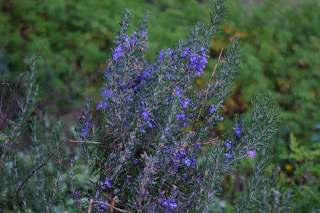 The final deficiency is that the weather is usually cloudy and rainy during winter. Those weather conditions are normal for this time of year, but any cloud at all will reduce the output of a solar panel, and very thick clouds can reduce the output to almost nothing at all. For about a month either side of the winter solstice I anxiously watch the weather and the weather forecast and hope that I never have to use the petrol generator (gas for people living in the US) to put some electrical charge into the house batteries. Years ago I set myself the goal of living with an off grid solar power system and not using the petrol generator. During those early years I heaped truck loads of beliefs onto the ability of solar panels to produce lots of electricity, whilst the batteries would be able to provide that electricity whenever I needed it. I began my off grid solar power journey with only eight panels. 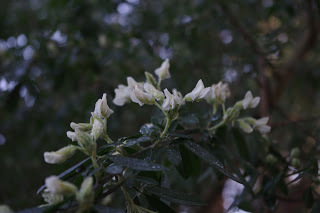 Let’s say that once the merest sniff of winter arrived (it was actually only very early autumn) in those early days, I ran out of power very quickly. Running out of power was the point in time that I discovered my ill feelings towards petrol generators. I originally purchased a quality generator, but I accidentally blew up the main capacitor inside the generator (my fault) during those early days. This disaster happened just prior to the Easter holiday that year. I took the generator to the shop for repairs. The generator was repaired easily enough, but I didn’t gain access to the repaired generator until after the Easter holidays. And every day the charge in batteries went lower and lower. The batteries eventually got to about as low as 30% full. Batteries are funny things because if you want them to last for a very long time, you basically can’t use them much. In practical terms, not using batteries much means not taking them below about 70% full. Also when the charge in batteries gets very low, the battery may not necessarily supply the sorts of power that electricity intensive machines (such as coffee machines with a heating element) require. Not supplying the editor with a morning coffee is definitely courting trouble. It would be trouble with me too! Long term readers will recall that in previous years I have had access to a wood fired oven. Due to the recent change in wood heaters, I now no longer have access to a wood fired oven with which to cook. Instead I have been using the electric oven (and occasionally the gas LPG oven). My electricity demands have increased recently due to the loss of that wood oven, and the other day the editor came up with a genius idea: Add more solar panels! Every year, we have made incremental improvements to the off grid solar power system. However, this year we intend to add five more solar panels to the system. This will bring the total number of installed solar panels to thirty. I have been told by a reliable source that the theoretical upper limit for solar panels in my off grid system is about fifty. Neither the editor, nor I have any intention of reaching that upper limit as there are significant diminishing returns to adding additional solar panels. And you have to remember that we are only seeking to use about 7kWh to 8kWh per day during this time of year. This expectation is far below the average daily household electricty usage in Australia. I really worry about people who promote solar power as a reliable replacement for base load electricity provided by coal fired (and their other ilk) power stations. 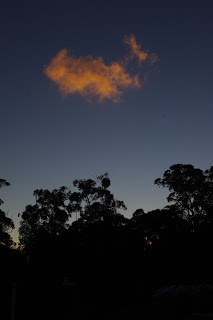 We’ve descended into a serious discussion here, so I thought that I’d lighten the mood by showing a photo of a very cool looking cloud which captured the light of the setting sun the other day. 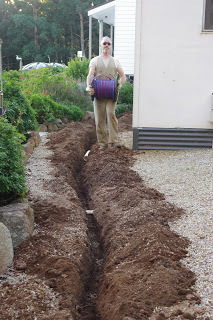 In order to connect up four of the five new solar panels, I had to run a very thick cable underground in a trench. 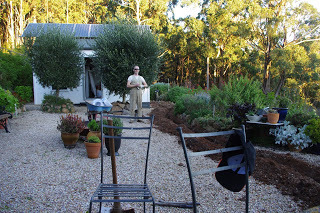 But first, that long 30m / 100ft trench had to be dug by hand through the editors beautiful courtyard and beyond. Oops! Talk about courting trouble! 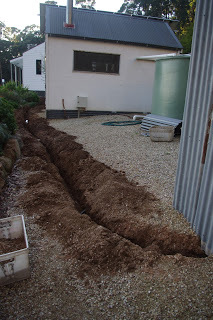 Fortunately the destination for that long trench was in a more utilitarian area than the courtyard. Anyway, the technical side of things is that with a longer cable run generally the thicker cable has to be. Thinner cables lose electricity to heat. Electricity, from my perspective, seems to be like trying to store water in a leaky bucket. Seriously, the electricity just disappears everywhere. I have to laugh when people suggest that we should cover the deserts with solar panels as they don’t realise that deserts tend to be a long way from anywhere with good coffee, and transmitting that electricity from such a great distance is a difficult and expensive business. They may also have forgotten that high temperatures in deserts tend to reduce the output from solar panels. Plus they also make the assumption that nothing lives in the desert that may also want to use that sun. 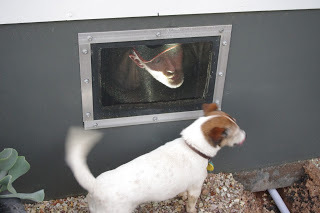 It is not all work here, as sometimes we just muck around, and the other afternoon whilst installing the long cable, I gave Scritchy the boss dog a scare from under the house. The cable was then enclosed by conduit to protect it. Then the area where the trench was dug was repaired. See how I avoid trouble with the editor: Clean up after yourself! 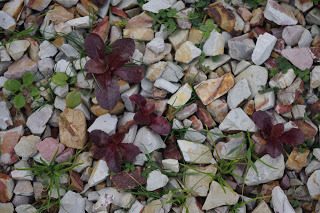 I then added a layer of crushed rock with lime over the top of the repaired surface in the courtyard. And you would never know what lies far beneath the surface! In addition to that, I added the first of the five solar panels to the off grid solar power system. 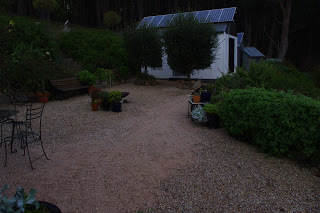 That solar panel is on the very left hand side of the white cantina shed. Far out, that was a lot of work this week. Still, I hope I never have to see that generator again! I reckon the fern gully is looking pretty good. 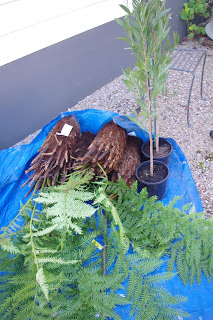 The tree ferns will get taller as the years go on and the other ferns will spread to cover the area. 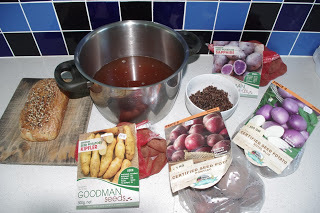 We harvested and cooked some beets this week. 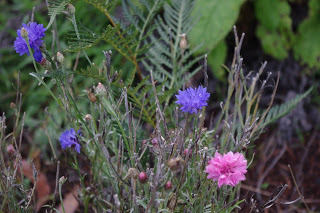 In the photo below on the left is a beetroot which has purple flesh. 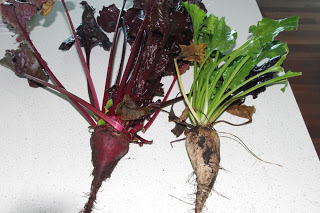 On the right in the photo below is a sugar beet which has 20% sugar and is very sweet. I really do hope that I don’t have to use that generator again! The temperature outside now at about 7.00pm is 9’C (48’F). So far this year there has been 394.8mm (15.5 inches) which is more than last week’s total of 385.8mm (15.2 inches). With the greatest of respects for the excellent New Zealand punk band “Split Enz” for their 1980 song “I hope I never” which was used in the story this week. As an interesting side note Tim Finn of that band is brother to Neil Finn who was the lead singer of the enormously successful band “Crowded House”. Continuing my previous school tales:- The more English than the English high school, where I was unceremoniously transferred as a teenager, practiced compulsory sports for all students. Since I enjoyed distance running anyway, I joined the schools distance running team. The running team trained after school two nights per week and then competed all over the countryside on Saturdays. That school managed to consume a lot of my previously “free” time. Fortunately that loss of free time did not hinder my little capitalist ways, and I was able to continue working paid jobs. Unfortunately that meant that I had to get up earlier in the mornings for the daily newspaper rounds, and I hate early mornings! Back in those days marketing was less sophisticated than it is today. A good example of that is that ‘Way Back Then’, adults used to lie to kids and tell them that they could ‘Do Anything’. Competing in the sport of running, proves just how preposterous that lie is because there is always someone who is faster, or who can run further, than you. And it just doesn’t matter what you or your parents may believe about potential running performance because every single week the placement results gave you a reality smack in the head! Fortunately, such concerns were far from my mind because I was the second fastest runner in the school. The kid that was the fastest runner in the school was marginally faster than I was, but I knew deep down that he was just a better runner. Being a better runner, he never had any serious concerns about his hard won status as the best runner in the school. However for me, I discovered that being second best in anything is a cool place to be, because there is absolutely no pressure to constantly perform at your best. And who performs at their best all of the time? Especially first thing in the morning. My favourite distance to run was 10km (6.2 miles) but I also occasionally ran 20km (12.4 miles). Over such distances, you get to enjoy a lot of free time in your own mind. Sometimes I used to sing songs in my mind that set a good cadence, and to me the experience is a lot like meditation. As a minor digression, in later years I was rather fond of the artist Moby’s song, Bodyrock which had a thumping dance beat which suited my running pace. 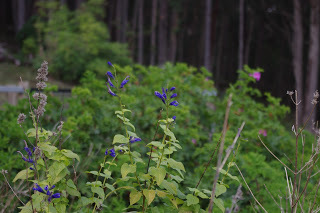 I have heard that some people struggle with that lack of noise when they are running (and swimmers too), but I am quite comfortable with the quiet of my own mind. 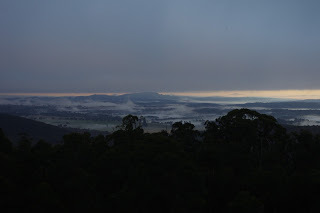 As another interesting side story, the editor and I once walked a 130km (80 mile) forest walk over five days in the south west of this state carrying all our own gear on our backs. We headed off on that long walk with great expectations that we’d somehow have awesome thoughts and insights, but no, nothing materialised. Mostly I was thinking about when the next chocolate snack would be. And more importantly which chocolate snack would it be (edit: Chris always got the Turkish Delight because I didn’t like it, but I told him that I saved it especially for him as a treat!) I reckon my time would have been better spent down at the local pub enjoying a tasty meal and a full pint of dessert stout! Some cheeky wag penned a story many long years ago about an anthromorphised tortoise racing an anthromorphised hare. The tortoise won that race against the much faster hare in what was an unlikely outcome. Clearly the author knew a thing or two about distance running, because a runner has to pace themselves and take into account their abilities and limitations. Over the long years of running, I knew many runners who like the hare, bolted away from the start line early and hard. However, after a short while, those hares were surprisingly easy for me to chase down as they ran out of puff (usually very early on). The tortoise’s strategy however, produces consistently good results. It is a bit of a shame that few people these days want to be identified as a tortoise. I’d be happy to be known as the little tortoise that could (clearly a pint of very excellent dessert stout may assist that imagery)! Over the years, I began running with older people (easier to win!!!) as part of the corporate world so I got to know plenty of them pretty well. I also noticed that a lot of them were showing signs of wear and tear from all that running, and it started me thinking about the process of entropy, and I was forced to consider my own future response to all of that wear and tear. So it was that one day many years later, I found myself in the physiotherapists clinic seeking help for knee problems. That event was a turning point in my life, and I knew I had to let the sport of running go before it consumed me. This week we have begun the process of expanding the berry and tomato enclosures. Wallabies are a local marsupial akin to a slightly smaller kangaroo and they love to eat all of the plants in those enclosures. Keeping them out requires some heavy duty fencing materials as they are quite shifty. Heavy duty fencing support materials means in this case, large treated pine posts cemented into the ground. Anything lesser than those posts and the wallabies can push the fencing over. They are a truly fearsome beast! Installing the treated pine posts which are cemented into the ground means digging holes where the posts will be located. I use my hand auger for digging holes in the clay, and that tool produces a surprisingly clean and deep hole. Of course turning the hand auger takes a fair bit of effort on my part, but I find the physical work to be quite rewarding. The hand auger also cleverly compacts the clay soil inside the auger where it can be lifted cleanly from the hole and relocated elsewhere. I usually dump the clay into a crate which I then carry to another location to use as fill. Six of the treated pine posts were placed in the holes next to the berry enclosure and then they were cemented into place. Observant readers will note in the next photo that the treated pine posts are a lot higher than they need to be. These posts will be cut down to a height which is consistent with the other fence posts in the future. Readers concerned about any potential waste will be pleased to learn that nothing goes to waste here and we have a future project in mind for those treated pine off cuts. Another two posts were placed into holes and cemented into a garden bed today. One of the posts will be used to relocate a garden tap which is currently located in the walking path. 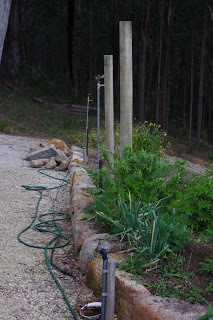 The other post will be used to anchor a bushfire sprinkler. Incidentally the post that has the garden tap will also have a hose hanger to get the 30m / 100ft hose / trip hazard, off the walking path. 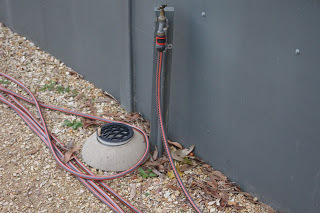 Unfortunately, the 12 Volt water pump which is used to pump water to that particular garden tap and bushfire sprinkler failed today without warning. So far I have tried about five different types of 12 Volt water pumps and other than one particular water pump which is performing very well, I am reasonably unimpressed with the other types of 12 Volt water pumps in terms of their quality and longevity. 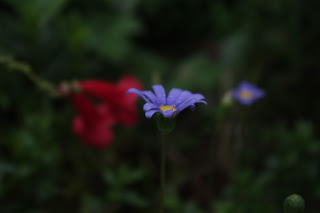 The water pump story is quite a frightening one, because every time I upgrade a water pump, the cost doubles over that of the previous water pump. On the other hand, if the water pumps don’t work, they are a complete waste of money. 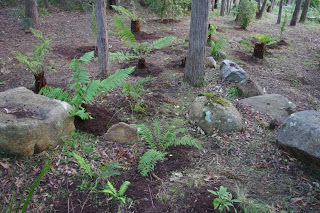 We adjusted the rocks in the garden bed below the berry enclosure and next to the machinery shed. 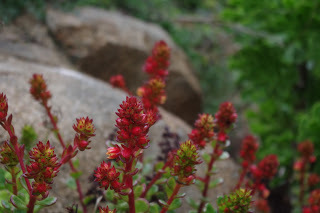 The reason for that adjustment is that some of the soil had been washing off the garden bed and flowing over the rocks holding back that soil. 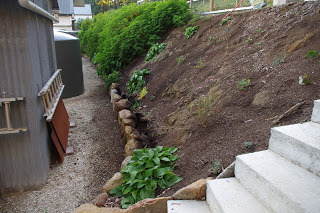 The original rock wall was placed too close to the sloping garden bed to be effective in holding the soil in place. 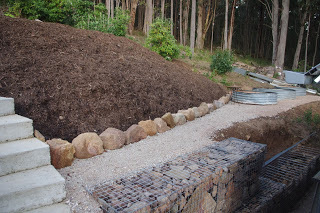 All of the rocks were moved away from the slope of the garden bed by about 25cm / 10 inches so that a more defined lip would catch any falling soil. A good dose of composted woody mulch was then applied to that steep garden bed. Previously we had applied a layer of mushroom compost. 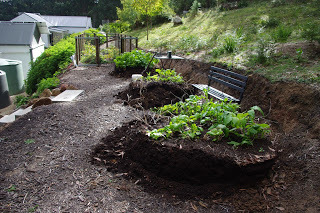 However over time, we observed that composted woody mulch is a much better material for a steep garden beds as it initially produces a waxy substance which binds the composted woody mulch together. 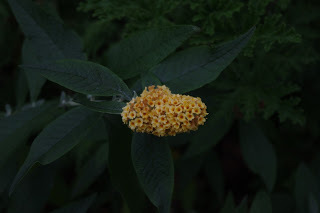 This waxy substance stops the top soil from sliding off a steep garden bed. Mushroom compost on the other hand produces fines which get washed downhill, only to end up on the walking path. Water is everything here and I noticed that a garden hose which was 30m / 100ft long had developed cracks and was in danger of failing. Anticipating that this may have had unpredictable and very wet consequences for the editor who may have been using the hose at the time, I took action! This is not a good situation for me and so the failing hose was replaced. It is interesting to me that the original hose was only slightly more than ten years old, but the UV in the summer sun here is quite extreme and it breaks materials down very quickly. Anyway, as hoses have been failing over time, I have been replacing them with more durable hoses that can be expected to have a much longer life than ten years. 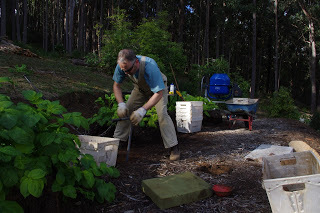 Observant readers will note that in the photo way way way above of the expanding the berry bed, a raised potato bed was in the process of being dismantled. And that means fresh home grown potatoes were harvested from the soon to be completely dismantled raised garden bed. Yum! The citrus trees produce well during the winter here although they have been very slow to ripen for some reason this year. The first grapefruit for the season is almost ripe, and look at how many more fruit are on that tree. The temperature outside now at about 8.30pm is 9’C (48’F). So far this year there has been 397.0mm (15.6 inches) which is more than last week’s total of 394.8mm (15.5 inches). If I had to use a word to describe the particular housing estate that the editor and I found ourselves in, I feel that that word would be: aspirational. Honestly from the street, you could smell the debt. The editor and I had parked the little three door dirt rat Suzuki vehicle in front of a huge two story house. That house was just one of many huge houses in an outer suburban housing estate. Of course if anyone chanced to miss the little dirt rat Suzuki, the neighbours certainly wouldn’t have failed to notice the bright yellow trailer. Perhaps it would have helped matters if I’d dressed for the occasion. But I hadn’t. Then again perhaps not, as even the dullest rats know that status is earned by not caring about status. The editor and I sauntered up to the door and I pressed the buzzer so as to notify the residents of our presence. The door to the over-sized house opened and the owner took stock of the two people standing on his doorstep. The very long dead Chinese master of strategy, Sun Tzu, recommends taking the initiative in uncertain circumstances. So I took the initiative and said in my most masculine and rural voice: “G’day mate. We’re here to pick up the water tank”. The owner was clearly uncomfortable with the concept of selling his water tank because, rather than directly responding to me, he looked past me and about the streetscape as if taking in the scenario and checking to see whether the neighbours were observing this transaction. It was all very strange and uncomfortable. He quickly recovered his wits and without introductions or even a handshake, he instructed the editor and I to meet him at the garage (of course we were not regarded as being worthy of a welcome into the house). The man quickly retreated into the house and the front door closed. 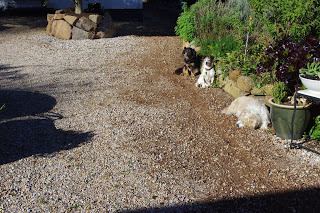 The editor and I were unperturbed and we casually walked to the garage door and waited as instructed. The whirring noise of a motor announced that garage door was soon to be raised to its full height. As the garage door was raised the editor and I could see the water tank that we had agreed to purchase from the man. The editor and I were happy with the water tank as it was in excellent condition and most importantly, very cheap. As the agreed $200 price changed hands, the man then said to us almost apologetically: “My wife wanted to sell the water tank”. I was acutely uncomfortable at the man’s shame at having to sell something and so the only reasonable reply that came to my lips was: “Right”. Whatever that means! The editor and I decided without communicating the fact, to take charge of the situation, and as we moved to take physical possession of the water tank, the man said: “Do you need a hand with that?” Fortunately I’d already had time to assess the man’s capabilities in that regard: “Nah mate, we’re right from here. See ya round!” The man then closed the garage door and that was the last we saw of him. 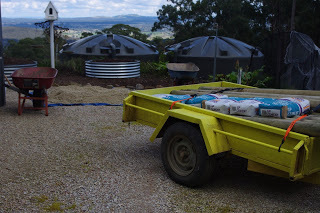 The water tank was easily manhandled and secured onto the bright yellow trailer and away we went with a second hand water tank for about a third the cost of a brand new water tank. I was surprised that the man was so concerned about his loss of status at having to sell an unwanted item. Who cares about status? I certainly don’t and I’ve observed that rats, mice and other rodents are shrewd creatures because they couldn’t give a fig for status, and only tend to concern themselves with outcomes. There is much truth in the saying “rat cunning”. This week I have been pondering the audaciousness of our rodent friends because they have managed to yet again to break into the supposedly rodent proof chicken enclosure. When that chicken enclosure was constructed two years ago, the editor and I went to extreme lengths to ensure that the rodents would be forever kept out. Steel and concrete were used in all sorts of cunning (or so we thought) ways in the construction. 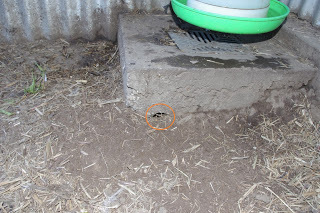 However, despite our best efforts, the rodents have outwitted us yet again and have simply burrowed a tunnel around a very deep concrete lined trench and after that feat, they then navigated under a very thick concrete slab. It is a very impressive feat. Neither the editor nor I have the slightest shame in selling any item here on the farm that serves no purpose. Everything is up for regular review (note to self: I must remember to keep working hard!). I imagined that we really didn’t have much on the farm that wasn’t being used. Anyway, sometimes things are so large and in front of your nose that you don’t notice them anymore. 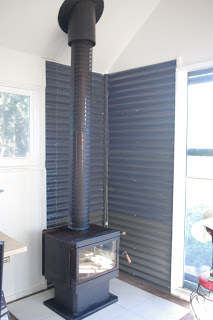 And such was the case with the old small wood heater in the cantina shed. That small wood heater was taking up a huge amount of floor space and we’d only used it two or three times in about seven years. It was the sharp eyed editor who actually noticed the small wood heater and suggested removing and selling it. The flue (a triple layered steel chimney) which protruded through the roof of the cantina shed left a giant hole in the steel roof sheeting which had to be repaired. Fortunately we had a spare sheet of grey roof sheeting to hand and that was used to cover the hole in the roof. 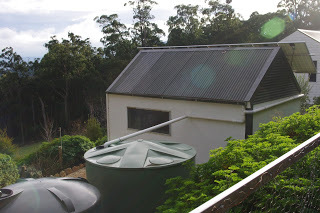 In the photo below observant readers will note that the replacement sheet is a slightly different colour than the original steel corrugated roof sheets. The strong UV sunlight over summer tends to fade colour paint on any steel corrugated roof sheets. 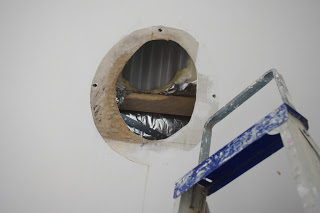 Of course, removing the flue for the wood heater also left a hole in the plaster inside the cantina shed ceiling. Observant readers will note in the photo above that just underneath the corrugated steel roof sheeting that there is a very thick fire blanket. This is a commercial product and not usually seen on domestic buildings. I was originally able to cover the entire roof of that cantina shed with a fire blanket because I had a left over roll of the stuff from the construction of the house, and that left over stuff was enough to do the entire roof of the cantina shed. It is also a very good insulating material. There is also a layer of wool insulation batts between the plaster and the underside of the fire blanket. 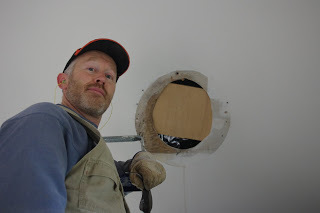 To repair the hole in the plaster I screwed in a small section of marine grade plywood. 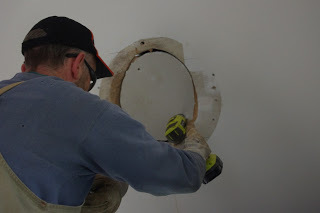 Then a repair section of plaster was screwed onto the plywood and the joins were soon filled with plaster bog. Plaster bog as long term readers may know, hides a multitude of sins! We also dug more holes this week with the hand auger. 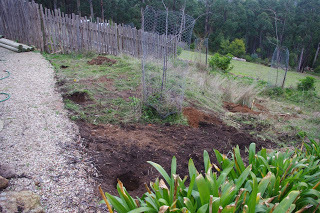 The holes will be used for treated pine fence posts so as to extend the tomato enclosure. 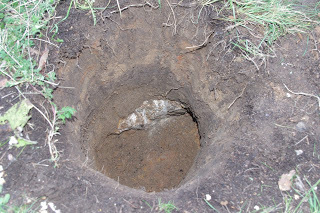 Of course as the case may be, sometimes when digging holes you can hit a floating rock which has to be broken up, if you want any depth to that hole. Soon all of the holes were dug. However we ran out of time to cement the treated pine posts into the holes and that will have to happen shortly. Most of the fruit trees have now gone deciduous and they are all enjoying plenty of chilling hours. Chilling hours are defined as air temperatures below 7’C / 44.6’F. If fruit trees don’t get enough chilling hours, then they will happily grow, but they may not set fruit. And every fruit tree has different requirements as to chilling hours.It is also important to note that the chilling hours do not have to be consecutive. I have observed that if some fruit trees have been put under considerable stress during the summer, they may not go deciduous. 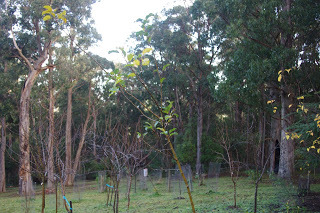 Walking around the orchard this evening I noticed an apple tree (in the next photo below) which had been severely punished by a very naughty wallaby. That apple tree has failed to go deciduous. Past experience has shown me that such fruit trees will generally not produce any fruit the following summer. Oh! The native birds here are very well fed and generally pretty happy with the conditions. 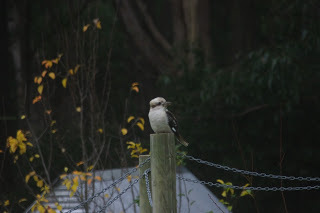 I spotted this Kookaburra the other day. The laughing call of the Kookaburra is unmistakable and the bird in the next photo below was sitting on a kiwi fruit support keeping an eye out for any grubs or other insects. Nothing beats the lemon trees for fruit at this time of year. 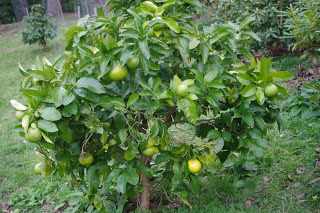 Two of the lemon trees (Eureka and Meyer) are almost a decade old now and they are producing huge quantities of fruit. 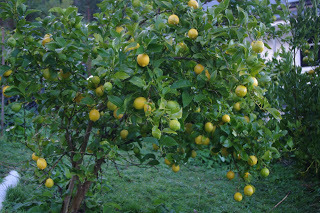 In previous years I have really struggled to know what to do with the huge glut of lemons (they were converted to lemon wine). In recent months I have been trading the lemons with a café in Melbourne for huge quantities of their used coffee grounds and the occasional coffee or lemon and coconut muffin. 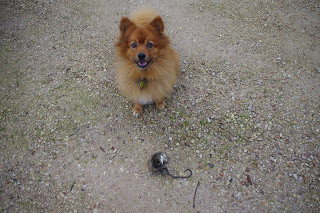 That is what I call rat cunning! I am using the huge supply of used coffee grounds as a fertiliser in the orchard. I simply throw the coffee grounds onto the ground in the orchard, and any trace of them disappears within two weeks. The temperature outside now at about 6.00pm is 6’C (43’F). So far this year there has been 400.2mm (15.8 inches) which is more than last week’s total of 397.0mm (15.6 inches).